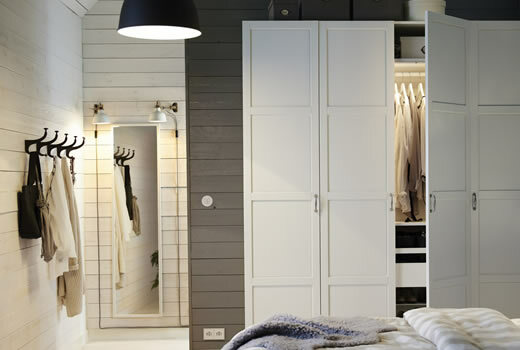 Either you choose one of our suggested storage solutions or create your own wardrobe; the result is a wardrobe to suit both your home and your clothes. You can create exactly the wardrobe you need by combining frames and doors from the PAX series with items from the KOMPLEMENT series of interior organisers. You can also use the Bedroom Planner to design your own unique PAX/KOMPLEMENT combination from scratch and check stock availability, calculate the price and print your list. Click our buying guides for PAX Series with sliding doors and hinged doors to see all parts and combinations.